The 2014 Nissan Pathfinder is the Japanese automaker’s largest crossover SUV, but it still retains the sleek styling that has made its smaller siblings a success. Standard 18-inch alloy wheels provide an athletic stance, while simultaneously combining with rear privacy glass to give off an air of premium quality. The 2014 Nissan Pathfinder is powered by a 3.5-liter V6 that generates 260 horsepower and 240 lb-ft of torque, which propels the Pathfinder from 0-60 mph in an even eight seconds and allows it to tow up to 5,000 pounds. All-wheel drive is also available. 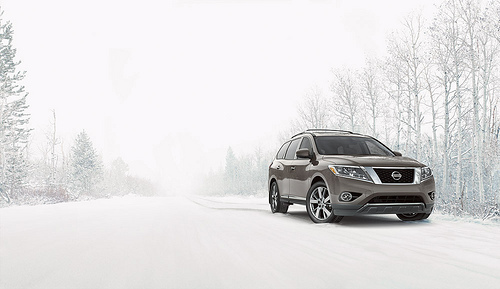 The versatile 3.5-liter V6 powering the 2014 Pathfinder also delivers respectable fuel economy. The 2014 Nissan Pathfinder is able to return 20 mpg city and 26 mpg highway. The interior of the 2014 Nissan Pathfinder is adorned with premium material and elegant design that delivers a borderline-luxury feel. There is no lack of available technology in the 2014 Pathfinder, as features include an eight-inch touchscreen display, navigation, Bluetooth connectivity, and a 13-speaker Bose audio system. Standard safety features on the 2014 Nissan Pathfinder include traction and stability control, antilock disc brakes, and a comprehensive suite of airbags that cover all three rows of seating. Rear parking sensors, a rearview camera, and a surround-view camera are also available.